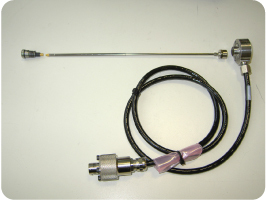 The in-spindle AE sensors are non-contact and come in two formats. These include a telescopic type and spiral-cable type. The telescopic type has a slide tube to facilitate installation and it sits inside a 4mm bore within a grinding machine spindle or rotary diamond dresser unit. This configuration allows the acoustic sensor to spin with the spindle and to be in close proximity to the grinding event, giving a clear uninterrupted signal. The acoustic signal is transmitted over an air gap to a non-contact receiver at the other end of the spindle. The spiral cable type works on the same non-contact principle but the telescopic slide tube is replaced with a spiral cable. 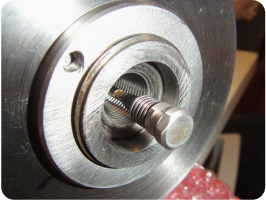 The in-spindle sensor is useful for OEMs manufacturing internal/ external grinding spindles or rotary diamond dressers. Schmitt are also able to provide mounting kits for end-user applications where a spindle bore is available. Mounting an AE sensor in this way gives a more direct signal and increased sensitivity.